A little bit of history first. Unlike previously, in 2008 racing season I discovered that I'm mentally and physically ready for time-trialing and first time did a TT race properly. I enjoyed it too. I finished 2nd in Bosnia & Herzegovina National Championships in Elite category. The plan was to go one place better in 2009. 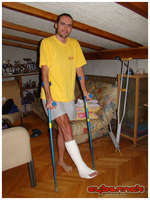 Unfortunately, in 2009 I got ill during the first part of the season and never managed get in shape that year. 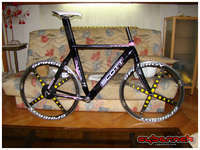 In 2010, I even decided to build a dedicated TT bike. However, a twisted ankle nailed me to bed for a couple of months, so that was another season put to waste. We are in 2011 now. 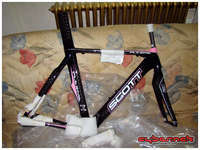 Third attempt at the National title and time to build a new old-stock 2008 Scott Plasma frameset I bought last year. It's pink, as it's a Contessa (women) model, but with normal men geometry ;-). A quick mockup using my Spinergy wheels. The plan was to make red stickers to cover the pink bits and redo the wheel stickers in a different style too. Bear in mind I'm building this bike for a single event, therefore the parts are nothing to drool over, but still there are some nice components in the mix! 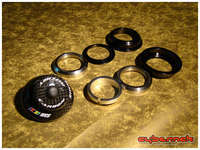 Ritchey Carbon internal headset (plus various carbon spacers, not pictured) - trick looking and light. 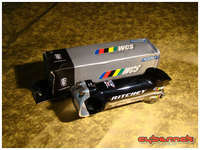 Ritchey WCS 4-Axis 100 mm stem - nice and light. 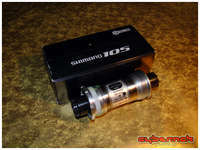 Shimano 105 5500 bottom bracket - can easily be swapped for Hollowtech II later on. 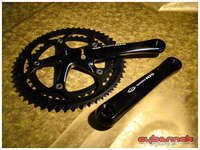 Shimano 105 5502 Black 172.5/53/42 crankset - I wanted carbon crankset but funds didn't allow it, so I got this black one. 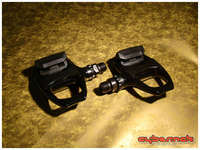 Shimano 105 R540 Black pedals - the same pedals as on my road bike, therefore useful as a spare set too. 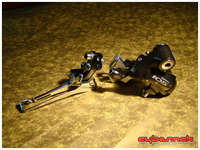 Shimano 105 5502 Black front derailleur and Shimano 105 5600 Black rear derailleur - allows for 10-speed conversion later on and/or easily replaced by a better rear der, if needs be. 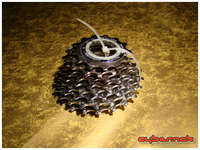 Shimano Ultegra 9-speed 13-23 cassette (13.14.15.16.17.18.19.21.23) - perfect gear cog ratios for me. KMC X9L Gold chain - colour-coordinated with some other parts on the bike. 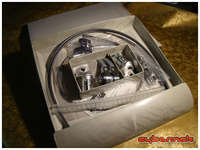 Tektro R750 Carbon brake calipers - very nice. 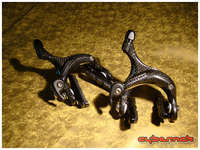 Tektro RX 5.0 Carbon brake levers - and very nice and light. 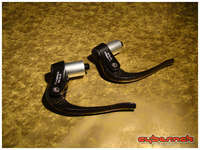 Shimano Dura-Ace 7700 (SLBS77H) 9-speed bar end shifters - the best single component on the bike :-). 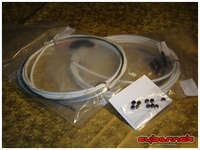 White gear and brake cable outers + black cable doughnuts - it's all about details :-).